KSA, Mumbai: State Bank of India (SBI) and Golden Gunners have completed the semifinals line up on the final day of the group stage. 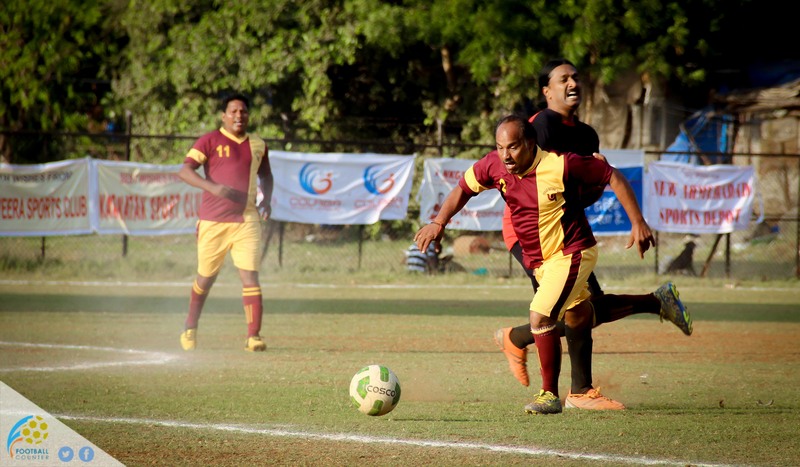 Here is how the action unfolded on day 4 of the KSA Veterans Football Tournament, 2017 being held at Cross Maidan. BOI 1-0 Tarun Sporting, Group B.
BOI came up against Tarun Sporting knowing that only a win would be good enough to have a shot of progressing to the next round. BOI led by their captain, Sanjeev Verma came out determined and created a lot of chances and were rewarded soon as their no.9, Humphrey Fernandes scored the first and the only goal of the game in the first half. BOI needed another goal to be the clear winners of the group but Tarun Sporting kept the goal count down to one. This meant BOI and SBI had mirroring results and the winner of the group had to be decided by a coin toss which went the way of SBI. Golden Gunners had their work cut out for them as they knew they had to win by a two-goal margin to progress and they did just that. Sheldon Fernandes scored the first goal and then it was soon followed up by J. J. Fernandes giving them a much needed two-goal lead. The Gunners then held on to their clean sheet and saw out the rest of the match meaning they win the group. This match was a dead rubber as RBI had already topped the group with two wins. Both the teams were playing for pride and the game didn’t disappoint. Both the teams had a lot of chances but the keepers kept the score at 0-0 but Slade Stanley had other ideas as he scored for Ordinance in the second half. Ordinance saw the rest of the game out and won the game 1-0. So, the group stage comes to an end as the teams produced some wonderful football. But the teams now need to be at the top of their game as we are at the business end of the tournament.